Techonomy founder David Kirkpatrick, Sprinklr's Simon Mansell and Bloomberg's Sarah Frier discuss Jack Dorsey's future at Twitter (and Square). They spoke with Bloomberg's Emily Chang on July 29 on "Bloomberg West." Neustar, Inc. (NYSE:NSR), announced Thursday it had acquired Bombora Technologies Pty Ltd (Bombora), based in Australia, for AUD $118.5 million, or approximately USD $86.9 million. Bombora and its subsidiaries, which include ARI Registry Services, provide registry services for a number of top-level domains (TLDs) including .au, .melbourne, .sydney, and over 100 new TLDs. The acquisition expands Neustar's registry services, which operates the .biz, .us, and .co TLDs, in addition to over 300 new TLDs. According to Neustar, the Bombora acquisition is expected to contribute approximately USD $8 million in revenue, and about USD $1.1 million, of operating income in 2015, which reflects the adjustment for deferred revenue on a fair value basis in accordance with business combination accounting principles. Over the last two years, Bombora has grown revenue at a compounded annual growth rate of 12% to approximately USD $20.6 million, in 2014 with operating margins between 25% and 30%. In 2014, Neustar reportedly acquired the registry operator of ccTLD .CO for US$109 million. AusRegistry is the Registry operator for all Australian commercial domain names such as .com.au and .net.au, and non-commercial domain names like .gov.au and .edu.au. ARI Registry Services provides services including Managed Registry Services for multiple global generic Top-Level Domain clients. ARI Registry Services also sells Licenced Registry Software to international Top-Level Domain clients and provides global anycast DNS services under the DiscoveryDNS brand. According to The Australian Financial Review | afr.com: "Bombora was founded 15 years ago by Adrian Kinderis and Simon Delzoppo with one computer, operating out of the front room of Mr Delzoppo's house. The acquisition means a handsome payday for the co-founders, who remain the majority shareholders in the company." What Does That July 29th Deadline Mean For .brand TLD Applicants? See also: NeuStar's (NSR) CEO Lisa Hook on Q2 2015 Results - Earnings Call Transcript | Seeking Alpha and After losing its biggest contract, this Va. tech company is trying to go global - The Washington Post: "... in March the Federal Communications Commission said it would hand the contract for so-called number portability services to another firm. That work represents about half of Neustar’s business. Neustar has filed suit against the FCC to reverse the decision. But in the meantime, it is beginning to prepare for the transition and search for new ways to make up for the lost business...."
Can VeriSign, Inc. (NASDAQ:VRSN) Keep Up with Analyst Expectations? (July 29, 2015): "Brokerage firm analysts covering the stock are estimating that the stock will reach $63.75 on a short term basis. This is the consensus price target based on the 2 polled by Zacks Research. The highest estimate stands at 70 while the lowest target is $57.5." Verisign Rating Increased to Buy at Zacks (VRSN) July 29, 2015: "VRSN has been the subject of several other reports. Topeka Capital Markets lifted their price objective on Verisign from $72.00 to $90.00 and gave the company a “buy” rating in a research note on Monday. Cowen and Company set a $61.00 target price on Verisign and gave the stock a “hold” rating in a research note on Tuesday, June 2nd. Two analysts have rated the stock with a sell rating, two have given a hold rating and two have assigned a buy rating to the stock. The company has an average rating of “Hold” and a consensus price target of $65.17." At this point, Verisign stock has blown past most stock analysts' "estimates." Questions: Will Google get completely out of the commoditized, very competitive, low profit-margin domain name business? Why did they ever get into it? Did someone in Mountain View drink the ICANN new gTLDs Kool-Aid? SEC Filings - Web.com Group, Inc.
Total revenue, calculated in accordance with U.S. generally accepted accounting principles (GAAP), was $135.7 million for the second quarter of 2015, compared to $138.2 million for the second quarter of 2014. Non-GAAP revenue was $140.0 million for the second quarter of 2015, compared to $144.7 million in the year-ago quarter, and above the high end of the Company's guidance range of $137.0 million to $138.5 million. GAAP operating income was $14.9 million for the second quarter of 2015, compared to $10.4 million for the second quarter of 2014. Non-GAAP operating income was $34.3 million for the second quarter of 2015, representing a 25% non-GAAP operating margin, compared to $38.4 million for the second quarter of 2014, representing a 27% non-GAAP operating margin. 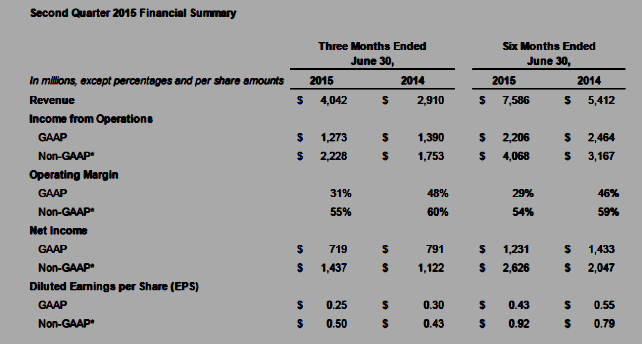 GAAP net income was $4.6 million, or $0.09 per diluted share, for the second quarter of 2015. GAAP net loss was $0.8 million, or $0.02 per diluted share, for the second quarter of 2014. Non-GAAP net income was $31.5 million for the second quarter of 2015, or $0.60 per diluted share, exceeding the high end of the Company's guidance of $29.0 million to $30.0 million, or $0.56 to $0.57 per diluted share. 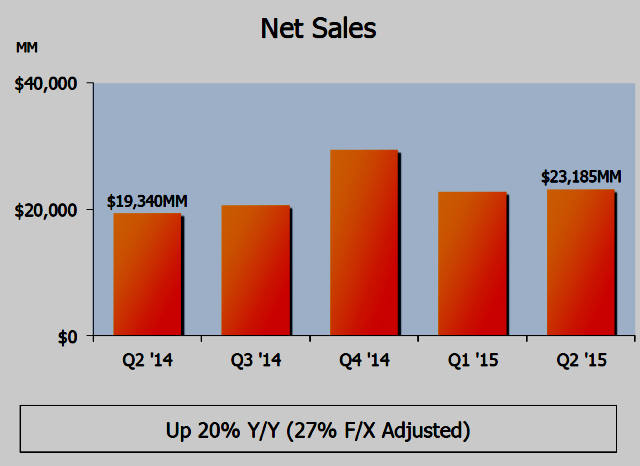 The Company had non-GAAP net income of $33.6 million, or $0.62 per diluted share, for the second quarter of 2014. Adjusted EBITDA was $38.4 million for the second quarter of 2015, compared to $41.8 million for the second quarter of 2014, representing a 27% and 29% adjusted EBITDA margin during three months ended June 30, 2015 and 2014, respectively. The Company generated cash from operations of $45.5 million for the second quarter of 2015, compared to $37.1 million of cash flow from operations for the second quarter of 2014. Web.com's total net subscribers were approximately 3,316,000 at the end of the second quarter of 2015, up approximately 21,000 from the end of the first quarter of 2015. Web.com's average revenue per user (ARPU) was $13.91 for the second quarter of 2015 compared to $14.89 for the second quarter of 2014. ARPU was up sequentially during the second quarter of 2015 from $13.75 during the first quarter of 2015. Web.com's trailing twelve month customer retention rate was 87.7% for the second quarter of 2015. This is in line with recent levels of high customer retention. Web.com used $30.0 million in cash to reduce debt during the second quarter of 2015. Repurchased 657,000 shares for $14.2 million in the second quarter of 2015. Venture Capital in China: Bloomberg West (July 27, 2015): Guests: GGV Capital's Jeff Richards, Softbank Capital's Josh Guttman, China Market Research's Shaun Rein, General Catalyst Partners' Prateek Alsi. UPDATE July 30, 2015: Baidu, Inc., the Chinese language Internet search provider, announced that its board of directors has authorized a share repurchase program under which the Company may repurchase up to US$1 billion of its shares over the next 12 months. (source: Baidu press release). 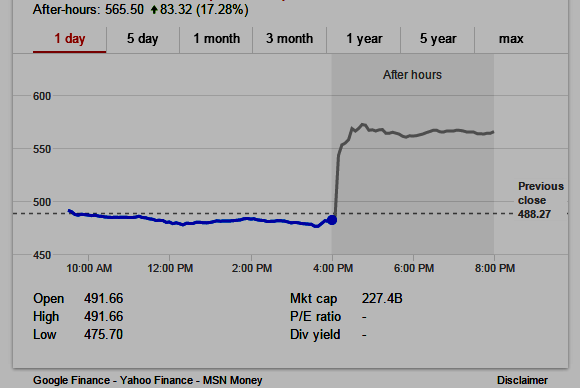 The buyback announcement follows weak earnings reported Monday, and subsequent drop in stock price. 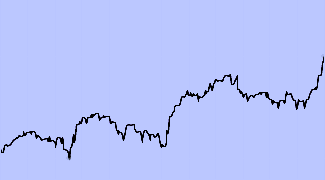 The shares NASDAQ:BIDU closed up today following the buyback announcement: $174.47 UP $4.46 (2.62%). Facebook Monthly Active Users (MAUs) source: Facebook Inc.
UPDATE: Facebook, Inc. (NASDAQ: FB) today reported financial results for the quarter ended June 30, 2015. "This was another strong quarter for our community," said Mark Zuckerberg, Facebook founder and CEO. "Engagement across our family of apps keeps growing, and we remain focused on improving the quality of our services." * Non-GAAP financial measures exclude amortization of intangible assets, share-based compensation and related payroll tax expenses. Non-GAAP net income and EPS also exclude the income tax effects of these non-GAAP adjustments. Non-GAAP information for the three and six months ended June 30, 2014 has been updated to exclude amortization of intangible assets to conform to our current period presentation. See the table in company financial results titled "Reconciliation of Non-GAAP Results to Nearest GAAP Measures." Daily active users (DAUs) – DAUs were 968 million on average for June 2015, an increase of 17% year-over-year. 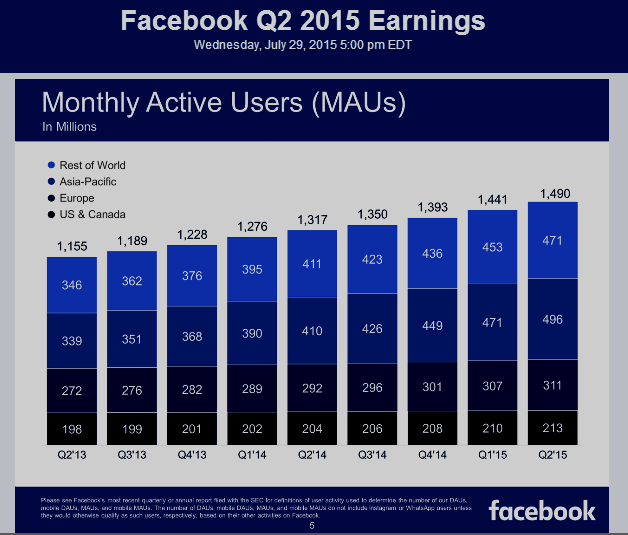 Monthly active users (MAUs) – MAUs were 1.49 billion as of June 30, 2015, an increase of 13% year-over-year. Mobile MAUs – Mobile MAUs were 1.31 billion as of June 30, 2015, an increase of 23% year-over-year. 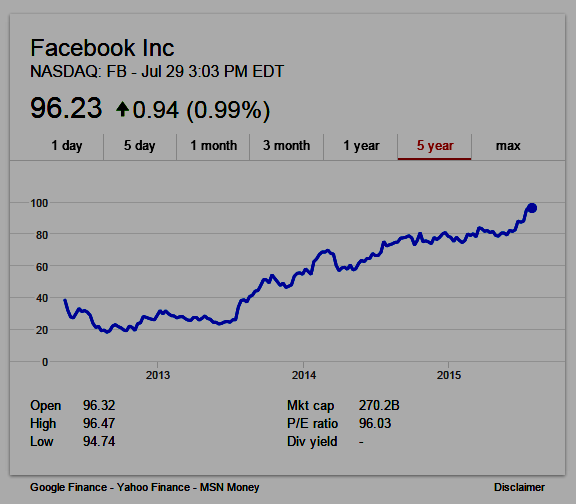 Facebook, Inc. (NASDAQ:FB) will release the company's second quarter 2015 financial results after market close on Wednesday, July 29, 2015, and will host a conference call to discuss its results at 2 p.m. PT / 5 p.m. ET (US). The live webcast of the call can be accessed at the Facebook Investor Relations website at investor.fb.com, along with the company's earnings press release, financial tables and slide presentation. Following the call, a replay will be available at the same website. A telephonic replay will be available for one week following the conference call at +1 (404) 537-3406 or + 1 (855) 859-2056, conference ID: 69328687. Disclosure Information: Facebook uses the investor.fb.com website and Mark Zuckerberg's Facebook Page (https://www.facebook.com/zuck) as means of disclosing material non-public information and for complying with its disclosure obligations under Regulation FD. StartUp Health: "StartUp Health is on a mission to help 1,000 health startups to reimagine and transform health care over the next decade. We believe entrepreneurs have the collective power to build the future of health care and we enable them to develop the leadership, relationships and industry intelligence to succeed." StartUp Health has the world's largest portfolio of digital health companies and offers entrepreneurs: The StartUp Health Academy, a long-term coaching program and trusted peer network and The StartUp Health Network, the largest stakeholder community of investors, customers, and advisors, to help companies grow through every stage of their lifecycle. The StartUp Health Academy includes 200+ entrepreneurs from 102 companies in 10 countries and more than 50 cities. StartUp Health companies have cumulatively raised over $200M and to date, three have been acquired - Basis Science by Intel, Avado by WebMD and Arpeggi by Gene by Gene. StartUp Health was founded by health tech entrepreneurs, Steven Krein and Unity Stoakes, and is chaired by former Time Warner Chairman and CEO, Jerry Levin. Some investors include Steve Case, Mark Cuban, Esther Dyson, Roger Ehrenberg, Brad Feld, Richard Forman, Jason Finger, Linda Holliday, Andy Litt, Jon Miller and Wayne Kimmel. Learn more about the Academy at startuphealth.com/academy. Square Is Going Public...But Why? - General Catalyst Partners' Prateek Alsi and Bloomberg's Leslie Picker discuss Square's planned IPO and what it means for CEO Jack Dorsey with Bloomberg's Emily Chang on "Bloomberg West" July 27, in the video above. What's the connection between Square and Twitter? Jack Dorsey. Earnings Release Highlights: Average Monthly Active Users (MAUs) were 316 million for the second quarter, up 15% year-over-year, and compared to 308 million in the previous quarter. The vast majority of MAUs added in the 2 quarter on a sequential basis came from SMS Fast Followers. Excluding SMS Fast Followers, MAUs were 304 million for the second quarter, up 12% year-over-year, and compared to 302 million in the previous quarter. Mobile MAUs represented approximately 80% of total MAUs. For additional information regarding the non-GAAP financial measures discussed in this release, please see "Non-GAAP Financial Measures" and "Reconciliation of GAAP to Non-GAAP Financial Measures" in the earnings release pdf. July 28, 2015: Chinese Government Support Tested as Stocks Extend Rout - Chinese stocks fell in volatile trading, extending the biggest one-day loss since 2007, as concern grew unprecedented government intervention will fail to shore up equities. Chinese Stocks Fall in Volatile Trading, Extend Rout - Bloomberg Business (July 28, 2015): "Chinese stocks fell in volatile trading, extending the biggest one-day loss since 2007, as concern grew unprecedented government intervention will fail to shore up equities." Shanghai Composite Index dropped -345.35 (8.5 percent) to 3,725.56 at the close on July 27, 2015: China Has Biggest One-Day Stock Crash Since 2007 - Bloomberg Business (July 27, 2015): "China’s stocks tumbled, with the benchmark index falling the most since February 2007, amid concern a three-week rally sparked by unprecedented government intervention is unsustainable." Tweets about $SSEC OR "Shanghai Composite"
Motorola LIVE Event, July 28 Video Replay above (July 28, 2015): Motorola believes everyone deserves the choice of a better mobile relationship. One that is personal, fulfilling, stands the test of time and fits your budget. Today we’re launching three new phones that live up to this promise. 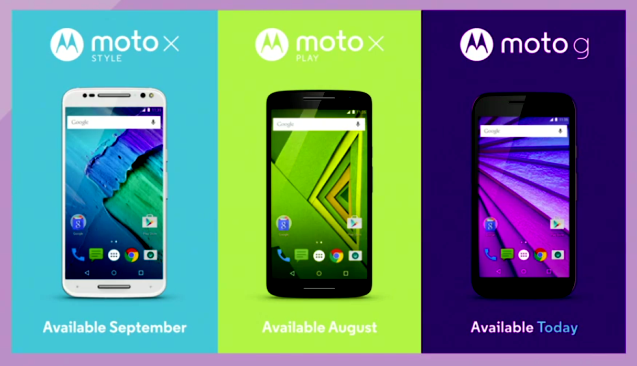 The new Moto G, Moto X Play and Moto X Style give people the mobile relationship they never knew existed. New Moto X, New Moto G - This LIVE event occurred in London, Sao Paulo, and New York, and was streamed online globally. Mobile: It Changes Everything from Andreessen Horowitz on Vimeo. Andreessen Horowitz (a16z.com) has shared a lot of data about whether and why this time is different. But beyond that, why is the tech market opportunity larger than any time in history? One word: mobile. In this update of his past presentation (slides below) on Mobile Eating the World -- delivered last month (June, 2015) at Andreessen Horowitz' annual investor meeting -- a16z's Benedict Evans shares just how and why mobile changes everything. Because tech is outgrowing the tech industry. See also: Domain Mondo: Startups, Venture Capital, Tech Markets, Unicorns, a16z: "Its domain name is a16z.com ... a 4 character dot COM. It is called a Numeronym and there are still millions of 4 and 5 character dot COM domain names available for reg fee of about $10.00 or less. 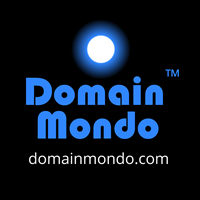 In the age of Global + Mobile, expect to see more and more numeronym dot COM domain names used by established firms and startups--from Silicon Valley to China to India to Everywhere! And unlike the new gTLD domain names, dot COM domain names work as expected on the internet and do not break stuff!" Mobile Technology is Outgrowing The Tech Industry--There is no point in drawing a distinction between the future of technology and the future of mobile. They are the same. In other words, technology is now outgrowing the tech industry. Originally published on Oct 28, 2014 (updated). Andreessen Horowitz has $4.2 billion under management and invests in entrepreneurs building companies at every stage – from seed to growth. "This time is different." But it's always different! So what's going on now in the public markets? Why does this even matter? For one thing, tech markets have grown significantly. And one big reason is internet and mobile. It's like a multiplier for the market size and opportunity. UPDATE: Andreessen Horowitz is a Silicon Valley based venture capital firm. Its domain name is a16z.com ("a" is the first letter of firm name, "z" the ending letter of firm name, 16 characters in firm name between "a" and "z")--a 4 character dot COM. It is called a Numeronym and there are still millions of 4 and 5 character dot COM domain names available for reg fee of about $10.00 or less. In the age of Global + Mobile, expect to see more and more numeronym dot COM domain names used by established firms and startups--from Silicon Valley to China to India to Everywhere! And unlike the new gTLD domain names, dot COM domain names work as expected on the internet and do not break stuff! In this episode of the a16z Podcast, Andreessen Horowitz managing partner Scott Kupor, mobile analyst Benedict Evans, and corp dev research partner Morgan Bender break down a slide deck we recently shared, including answers to what are these so-called “unicorns,” how it affects venture capital and the funding landscape, and how Andreessen Horowitz define a "quasi-IPO." Taking the Pulse of VC and Tech | Andreessen Horowitz: "In this wide-ranging conversation about ‘stuff’ that took place at this year’s annual investor meeting (VCs have investors too, in the form of ‘limited partners’), Fortune’s Dan Primack interviews Marc Andreessen — and asks the tough questions. About VC and returns, founders and startups, ethical vetoes, Facebook, and more. Listen in on this edition of the a16z Podcast." OnePlus 2: World’s First Product Launch in VR - Jul 27, 2015: Learn about the OnePlus 2, explore the company's headquarters, and immerse yourself in a one-of-a-kind 360 experience. Below is the Paris Communiqué issued by ICANN's CCWG-Accountability following its recent face to face meeting in Paris. As stated below, the public comment period on the CCWG's 2nd draft proposal is expected to be open from July 31-September 8, 2015. All issues open for public comment can be accessed on the ICANN website. Members and participants of the Cross Community Working Group on Enhancing ICANN Accountability (CCWG-Accountability) met in Paris, France, from 17-18 July 2015. The event served as an opportunity to further advance the discussion on key outstanding issues and to reach agreement on next steps towards finalizing its Work Stream 1 recommendations. This gathering comes on the heels of ICANN53 in Buenos Aires, as well as a series of prior discussions and feedback in response to the public comment period of the group's draft report. The meeting had strong community participation, with 76 group members and participants attending in person and an additional 30 joining remotely. Further, several members of the ICANN Board of Directors, Governmental Advisory Committee (GAC) representatives, external Advisors and local stakeholders were also present (list of all participants). Following close examination and a series of dialogues and exchanges on the merits and drawbacks of the three (3) community empowerment models presented, the group agreed to advance the Community Mechanism as Sole Member Model (CMSM) as part of Work Stream 1, noting the momentum that emerged among the members of the CCWG-Accountability in support of this model. Under this framework, the Supporting Organizations (SOs) and Advisory Committees (ACs) would collectively participate together as the sole member of ICANN. This coordination of SOs and ACs would be empowered to take certain special actions within ICANN. Further, an exchange of views will occur with the community before decisions are made. Additional details will become available over the next few weeks as the community continues to develop the framework for this model. The 'Empowered SO/AC Designator' and 'Empowered SO/AC Membership' models were also discussed and considered. Brief descriptions of each of these models can be found here [PDF, 564 KB]. 31 GAC members submitted individual contributions to the CCWG-Accountability ahead of the Paris meeting. The contributions addressed a series of questions aimed at further clarifying the positions ofGAC members with regard to their vision of the role of governments in a post-transition environment. While in Paris, discussions focused on identifying requirements such as the role of governments with regards to public policy and assuring that the ICANN Board of Directors does not act outside of ICANN's mission. The group also acknowledged the challenges for governments to make certain decisions regarding their participation into the new community model in time for ICANN54 in Dublin. Fundamental bylaws: All foregoing mechanisms are to be provided for in the bylaws as "Fundamental bylaws"
The group agreed to continue coordinating their activities with the CWG-Stewardship in an effort to ensure that the recommendations put forth by the CCWG-Accountability fully meet the requirements [PDF, 1.4 MB] (p. 20-21) of the naming community. The group reached broad agreement on elements of the enhanced IRP, including diversity as a guideline for conformation and community-driven panel selection processes. Additionally, a subgroup will be formed to further develop IRP rules and procedures as well as fine tune the subject matter for IRP. Over the coming days, the group faces the challenge of addressing all outstanding issues and compiling a complete 2nd Draft Proposal for a 40-day public comment from 31 July until 23:59 UTC on 8 September 2015. It is important to note that this public comment period will directly parallel the public comment on the Interim Final Transition Proposal being assembled by the IANA Stewardship Transition Coordination Group (ICG). The first public comment included over 60 submissions that the CCWG-Accountability is carefully considering. Comments were helpful in preparing for the Paris meeting and are being considered in developing the 2nd Draft Proposal. Responses to these comments will be published along with references to the 2nd Draft Proposal to acknowledge substantive changes where applicable. The CCWG-Accountability aims to have a Work Stream 1 proposal finalized and distributed to its chartering organizations prior to ICANN54 in Dublin. [ICANN 54 - October, 2015]. Based on the current work plan, the group confirms its plans aiming at delivering the Work Stream 1 proposal to the U.S. National Telecommunications Information Administration (NTIA), by late October or early November. Amazon.com Investor Relations: Press Release: Amazon.com Announces Second Quarter Sales up 20% to $23.18 Billion "Net sales increased 20% to $23.18 billion in the second quarter, compared with $19.34 billion in second quarter 2014. Excluding the $1.39 billion unfavorable impact from year-over-year changes in foreign exchange rates throughout the quarter, net sales increased 27% compared to second quarter 2014." In addition to the above, Amazon Web Services (AWS), Amazon's Cloud services, had Q2 revenue of $1.82B, +16% Q/Q and +81% Y/Y. Annual growth accelerated sharply from Q1's 49%. AWS segment operating. profit rose over 5x Y/Y to $391M. Amazon shares surged in after hours trading, easily taking out their old highs, and causing Amazon's market capitalization to surpass Wal-Mart's (see below). OnePlus2 Launch Date: July 27, 2015 (read twitter feed below). Verisign hosted a live teleconference call on July 23, 2015, at 4:30 p.m. (EDT). An audio archive of the call is available at https://investor.verisign.com/events.cfm. VeriSign, Inc. and subsidiaries ("Verisign") reported revenue of $263 million for the second quarter of 2015, up 4.9 percent from the same quarter in 2014. Verisign reported net income of$93 million and diluted earnings per share of $0.70 for the second quarter of 2015, compared to net income of $100 million and diluted EPS of $0.71 in the same quarter in 2014. The operating margin was 56.7 percent for the second quarter of 2015 compared to 57.2 percent for the same quarter in 2014. Verisign reported, on a non-GAAP basis, net income of $99 million and diluted EPS of $0.74 for the second quarter of 2015, compared to net income of $96 million and diluted EPS of $0.68 for the same quarter in 2014. The non-GAAP operating margin was 61.3 percent for the second quarter of 2015 compared to 60.9 percent for the same quarter in 2014. A table reconciling the GAAP to the non-GAAP results (which excludes items described below) is appended to this release. "I am pleased to report another quarter in which we have created and delivered value for our shareholders," commented Jim Bidzos, Executive Chairman, President and Chief Executive Officer. Verisign ended the second quarter with cash, cash equivalents and marketable securities of $1.9 billion, an increase of $460 million as compared with year-end 2014. Cash flow from operations was $175 million for the second quarter of 2015, compared with $121 million for the same quarter in 2014. 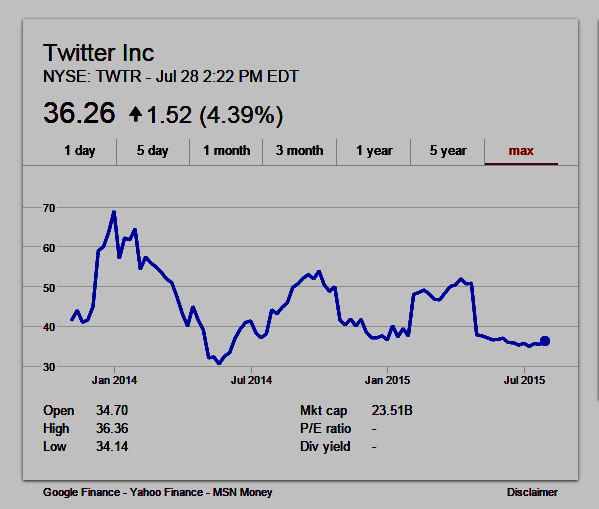 Deferred revenues on June 30, 2015, totaled $932 million, an increase of $41 million from year-end 2014. Capital expenditures were $9 million in the second quarter of 2015. During the second quarter, Verisign repurchased 2.5 million shares of its common stock for $156 million. At June 30, 2015, $761 million remained available and authorized under the current share repurchase program which has no expiration. For purposes of calculating diluted EPS, the second quarter diluted share count included 17 million shares related to subordinated convertible debentures, compared with 11.3 million shares in the same quarter in 2014. These represent diluted shares and not shares that have been issued. 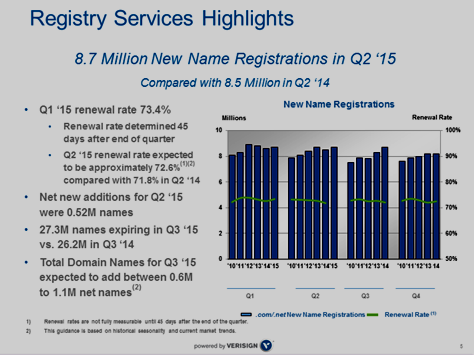 Verisign Registry Services added 0.52 million net new names during the second quarter, ending with 133.5 million .com [118.5 million] and .net [15 million] domain names in the domain name base, which represents a 3.1 percent increase over the base at the end of the second quarter in 2014, as calculated including domain names on hold for both periods. In the second quarter, Verisign processed 8.7 million new domain name registrations for .com and .net, as compared to 8.5 million for the same period in 2014. The final .com and .net renewal rate for the first quarter of 2015 was 73.4 percent compared with 72.6 percent for the same quarter in 2014. Renewal rates are not fully measurable until 45 days after the end of the quarter. Verisign announces an increase in the annual fee for a .net domain name registration from$6.79 to $7.46, effective Feb. 1, 2016, per its agreement with the Internet Corporation for Assigned Names and Numbers. (ICANN). Non-GAAP financial results exclude the following items that are included under GAAP: stock-based compensation, unrealized gain/loss on contingent interest derivative on subordinated convertible debentures, and non-cash interest expense. Non-GAAP net income is decreased by amounts accrued, if any, during the period for contingent interest payable resulting from upside or downside triggers related to the subordinated convertible debentures and is adjusted for an income tax rate of 26 percent for 2015 and 28 percent for 2014, both of which differ from the GAAP income tax rate. A table reconciling the GAAP to non-GAAP operating income and net income is appended to the earnings release. 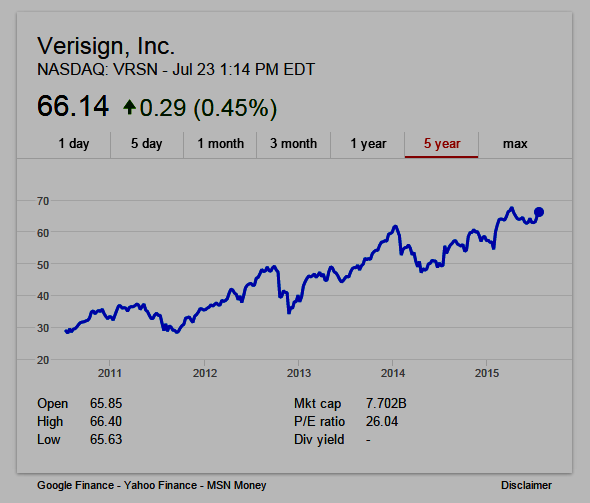 Events & Presentations - VeriSign, Inc.
UPDATE (video above) July 24, 2015: Why Nikkei paid Pearson $1.3 billion for the Financial Times: Japan’s biggest financial news publisher surprised the media world by buying the Financial Times and paying a quite a premium compared to other recent newspaper deals. Nikkei Inc., whose flagship Nihon Keizai Shimbun is Japan’s leading business daily, is paying $1.3 billion to Pearson Plc to buy the FT Group, which owns the salmon-hued paper with an editorial team of roughly 500 journalists in more than 50 locations around the world. Pearson NYSE:PSO (5-year chart above) announced today it has agreed to sell its financial media asset Financial Times (FT) to Nikkei, a Japanese financial newspaper. Statement at Pearson to sell FT Group to Nikkei Inc.
Today we have made a significant announcement, which is that we have agreed to sell the Financial Times to Nikkei. This is an important moment for both Pearson and the FT, so I wanted to share more about what’s happening and why. For fifty-eight years, Pearson has been the proud owner of the Financial Times. We’ve invested in its global expansion and digital transformation, through good times and bad; and all the time, protecting its editorial independence and championing the quality and breadth of its journalism. 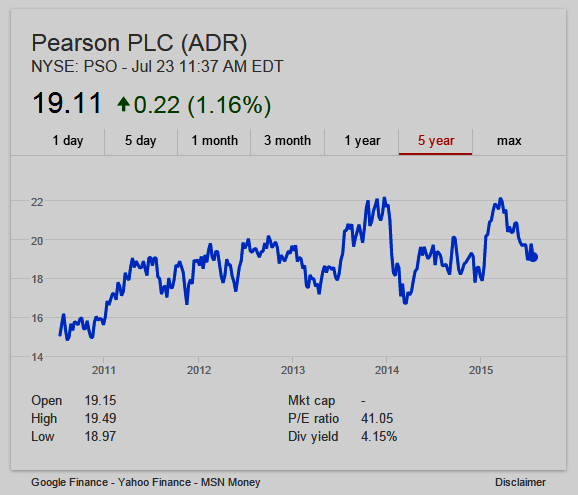 Both Pearson and the FT have benefited greatly from the relationship. The FT is recognised across the globe as an intelligent and authoritative commentator on world events, finance, commerce and economics. As you all also know, in recent years, we’ve developed an increasing focus on our biggest, most exciting opportunity – to help people make progress in their lives through learning. As that opportunity has crystalised, it’s become clear to me and the Pearson board that the scale of the challenge requires our undivided attention. At the same time, we are at an inflection point in global media.The pace of disruptive change in new technology – in particular, the explosive growth of mobile and social media – poses a direct challenge to how the FT produces and sells its journalism. It presents the FT with a great opportunity too – to reach more readers than ever before, in new and exciting ways. Nikkei has a long and distinguished track record of quality, impartiality and reliability in its journalism and global viewpoint.The Board and I are confident that the FT will continue to flourish under Nikkei’s ownership. I’ve every confidence in the FT’s ability to seize the moment, as it has done ably so far, in its digital transformation. The readership is at an all time high, with readers willing to pay more than ever for its journalism. But, after much reflection and detailed analysis of both the opportunities and challenges that lie ahead, we have concluded that the best way to ensure the FT’s continuing journalistic and commercial success is for it to be part of a global, digital news organisation that is 100% focused on these same issues. The FT remains part of Pearson until we complete the transaction around the end of this year. I’m very pleased that we will continue to work together in areas like business education and teaching English to professionals in countries such as China. I’ll be over at the FT later this afternoon to meet in person with as many colleagues as possible. I know many of you across Pearson will have questions about what this means for our Professional line of business, of which the FT is a part. Pearson VUE and our English business remain incredibly important to Pearson, and are a big part of our future. John Ridding, Bob Whelan and Tas Viglatzis will be in touch directly with the Professional teams today, and in the weeks ahead, to keep everyone updated. We plan to reinvest the proceeds from today’s sale to accelerate our push into digital learning, educational services and emerging markets. We will focus our investment on products and businesses with a bigger, bolder impact on learning outcomes, underpinned by a stronger brand and high-performing culture. This will help us progress toward a future where learning is more effective, affordable, personal and accessible for people who need it most. By doing so, we can help more people discover a love of learning and make progress in their lives. This is the promise of learning– and the future of Pearson."